Back before Christmas I wrote a post (in my head) that I titled: Four Things That Will Change Your Life. They changed my life so surely they'll change yours, right? I decided that claim was a bit dramatic (and the post never moved from my head to my computer) so I moved on. BUT, the truth is that I really have stumbled upon some things that aren't necessarily life-changing but they're too good not to share. So, I'm introducing "Tell About It Tuesday". And I can only guarantee you 3-4 Tuesdays worth of posts. I typically wash my hair every day. Not because I want to, but because my scalp is oily. Not only do I wash my hair every day, but I blow dry and straighten it too. You can imagine how dry my ends are in the land of no humidity. I really have tried to go a day between washings because I know it's best for my hair, and I can totally pull it off, but by the end of the second day of unwashed hair, it starts to get gross--oily and *ahem* stinky. Enter Batiste Dry Shampoo. I spray it on my hair (it turns my hair whitish-gray), wait a few minutes, massage it into my scalp, then brush it completely out. My "shampooed" hair is shiny, smells good, and has amazing body with NO residue from the shampoo. It actually looks better on the days I use the dry stuff than it does on the days I go through my whole wash/dry/straighten routine. I've been using this stuff for about a month and WOW. It really has changed my life morning routine. Now I live for days that I can get ready in fifteen minutes or less! Seriously...you MUST try this product!!! I found it at Sally Beauty Supply, but I *think* it might also be sold at Ulta. I know it's available at Ulta online but I'm going to see if I can find it at my Ulta store because then I can use one of the endless coupons I get from them! You can also buy it from Amazon. I like the blush scent the best. The original scent is okay, but it's a little funky. I tried that scent first and was glad I also had the blush scent to try. I haven't tried the tropical. It retails for about $7.50-$8.00 for a 5.5oz can. I actually bought two smaller (1.5oz) cans instead because they were on clearance and I wanted to try the smaller size before I was "fully" invested. I'll be buying the big one from now on. I also picked up a can of this at Walmart last week to compare. It's Salon Grafix Dry Shampoo and it's slightly cheaper (around $5 for a can). I used it over the weekend and didn't love it. It left my hair feeling slightly sticky and like it had (even) more product in it. I think the Batiste shampoo makes it feel cleaner. I will say that the Salon Grafix shampoo smells really good though. I hate to waste things so I'll finish the can and then buy more Batiste! So, there you have it! 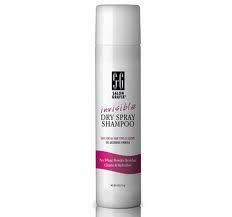 Let me know if you've used dry shampoo and if you have another one that you love! I've heard Bumble and Bumble is good (but pricey) and I've heard the one by Tigi is good too. Tigi's is called Dirty Secret. I love how they name their products. I think I like the price tag on the Batiste dry shampoo best though! Let me know if you try it!!! I always love your recommendations, and I've actually been looking for a dry shampoo that people like. I try to wash every other day, but I have the same problem you do. By the end of the second day I just can't stand it and I usually give in and just wash it. But lately there's barely time for a shower let alone a wash, blow dry, straighten routine, so maybe this would be good. Love Ulta! I just discovered it for some of my favorite products and I think I might like it more than Sephora! Fascinating. I spend less than two minutes on my hair every day, so this wouldn't really be a time savings for me, but it is an interesting idea. Funny that you should post about this today. I just used mine for the first time yesterday. I have Tresemme Dry Shampoo (about $5.50). It worked pretty well but I'm not as crazy about it as you are about yours! Maybe I need to try it! Love this Try it Tuesday....I've been looking at these dry shampoos but hadn't yet had the courage to try on...now I will! Sounds like a neat concept - but one I've never heard of before. Considering I live in the middle of nowhere, I hope you understand. Ha! I guess I should browse-shop more. Maybe I'd find some cool things like this?? I usually wash my hair every other day, too, but now that I get highlights it starts to look really greasy once my roots start to show. I actually noticed my local big-box store (not WM) had a dry shampoo when I was there the other day and I thought about keeping some on hand, but now that I chopped 13 inches off of my hair last month I decided to wait since it's been a lot quicker to get ready now. Okay, when I first read it, I was skeptical. I've never heard of such a thing, but boy that would be great for my hair. I have to wash/dry/style mine daily and in the winter my hair gets so dried out. It's gross. I have to try this! love the tell about it tuesdays! i have tried dry shampoos--tresemme and ojon. tresemme leaves my hair dull and sticky. ojon--can't remember why i didn't like it--could have been the price tag! 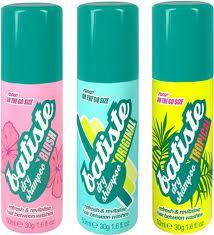 i will give batiste a try! thanks! My daughter totally needs this. There are mornings where this would save a ton of time...thanks for the brand recc. We are getting together soon...right? I am intrigued...and a little frightened.But what if it really works....? It could change everything! Maybe I'll get it and try it on a day I don't have to be anywhere except the post office or grocery store. Kind of a test run. Thanks for posting about this! I've been wanting to try one but didn't know anyone else who had used it. I'll be making a trip to Ulta this weekend!